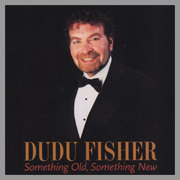 David “Dudu” Fisher, the international singing sensation and award-winning recording artist, returned to New York in Something Old, Something New, an intimate musical evening of story and song, which played a critically-acclaimed limited engagement at the Mazer Theatre in the heart of Manhattan’s historic Lower East Side during the Fall and Winter of 2002. Directed by Richard Jay-Alexander (whose previous credits include concerts for Barbra Streisand, Bernadette Peters, Russell Watson and many more), Something Old, Something New was specifically created by Mssrs. Alexander and Fisher in conjunction with Ergo Entertainment, to showcase Dudu’s extraordinary talents by covering a broad range of musical genres and styles including traditional Jewish standards, pop hits from Elvis Presley and the Red Hot Chili Peppers among others, and a wide variety of Broadway showtunes by composers such as Berlin, Gershwin, Rodgers, Bernstein and Sondheim.